It's new, so not much to look at yet, but will be entertaining, especially for those who like extreme training. Phil trains "for climbing" but he mainly trains for training. We've trained together, on and off, for about 17 years now, and Phil is probably the most diligent person I know when it comes to sticking to a workout program. 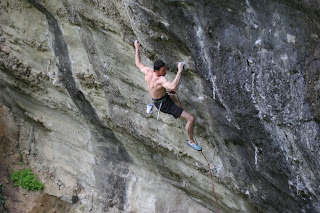 He's an enigma to most, since his workout is just as, if not more, important than his climbing. This no doubt holds him back when it comes to his climbing resume (but how important is that, really?) but it means that he's very rarely injured and strong as a friggin' ox. As a testament to how hard and precise he trains, not one person has ever completed an entire training cycle trying to keep up with Phil and not been injured. Phil is the main guy I used to experiment with on diet and training during the early 90s, when no one really knew how to train for climbing. We've got some pretty good stories and I'm sure they'll show up on his blog. So stay tuned. Photo is of Phil on his route, The Old Pro Skill, Owl Tor, Silly Rock, near Santa Maria, Ca, in 2007. It was originally rated 5.12c but is realistically more like 13b--about standard for the Tor--and is one of the many routes Phils runs laps on as if they were 5.10. I've got plenty of old pics that I'll have to dig up. Here is an article on Chuck Feeney, a billionaire who has given almost all of his money away to charity. He doesn't own a house or a car or hang out with "society" types. Inspiring. Here's a slideshow of our weekend in Moab. As you might surmise from our attitude, we didn't win. Didn't even come close. We probably, however, won the party. There was at least one martini on the podium that was courtesey of us. "We expected to see differences between disease prevalence in the United States and Europe, but the extent of the differences is surprising," said Ken Thorpe, professor of public health at Emory University and a study co-author. "It is possible that we spend more on health care because we are, indeed, less healthy."